The Secret Campsite Wild Boar Wood provides camping in a beautiful setting. Our woodland campsite in Mid Sussex allows campers to have their own campfires. There are just nine ‘wild glamping’ bell tents on site. Raised on wooden bases our bell tents are set within glades and natural openings among the trees for a forest camping feel. We encourage an experience of discovery at all the of The Secret Campsites so you can take time to get to know the environment. You can learn to recognise the indigenous trees; Oak, Beech, Hornbeam, Birch, Ash, Holly and Hazel. You can listen to and identify the many and varied songbirds. 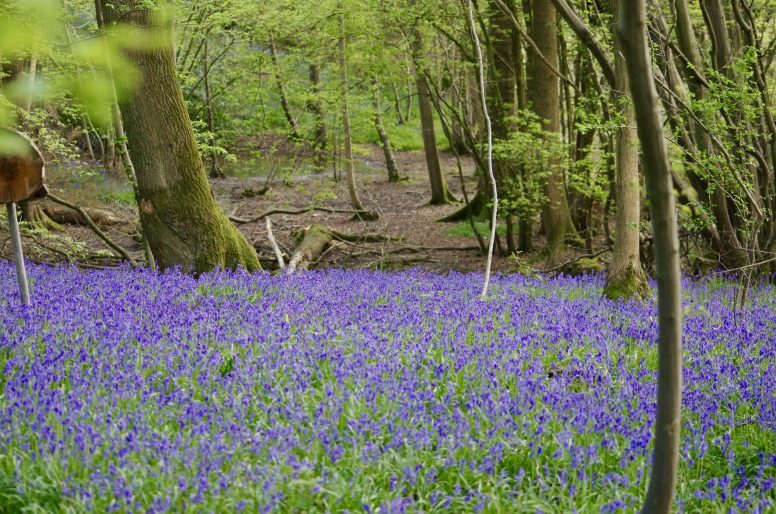 Spot the tracks and habitat of the local wildlife, and learn the names and properties of the woodland plants. We prefer to label our fully equipped bell tents as ‘wild glamping’. In comparison to other luxury camping campsites, we aim to offer a real, off-grid woodland campsite experience. At The Secret Campsite Wild Boar Wood we have no hair dryers, mobile phone chargers, butler service, silk sheets or hot tubs. Rather, we provide a real camping experience made easy. Supplying just about all the camping equipment you should need, all waiting for you, setup in a lovely campsite in the woods. The Secret Campsites are based on a philosophy of living lightly on the land in harmony with nature. We believe the conservation of trees offers overwhelming benefits to our landscape and lives. 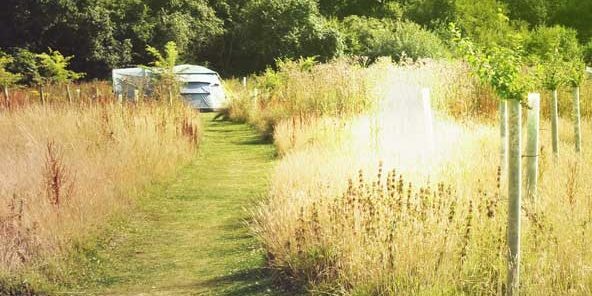 Our philosophy at the campsite is also to protect and enhance the environment. Fallen branches and decaying trees help to maintain a healthy and vibrant ecosystem which enhance your interactions with nature. We ask all campers not to collect any firewood from our forest and only to use wood supplied by us, or that you have brought either from home or from another sustainable supplier. 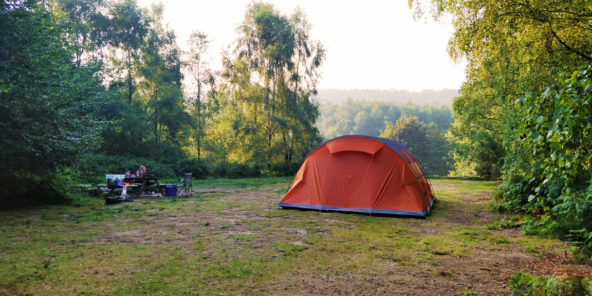 The local Council in which our West Sussex woodland campsite is located place certain restrictions on our operation as we are within Areas of Outstanding Natural Beauty (AONB). These dictate certain restrictions on our site facilities, their size, our infrastructure and the amenities we may offer. Keeping every item we provide in our bell tents in mint condition in a woodland without a power source provides its own challenges. Using resources for their full lifespan is our ethos and a necessary practise in our small business. We endeavour to always provide clean, practical equipment and facilities, within the confines of our planning permission and the environment in which we operate. We do not use any electricity at Wild Boar Wood; lighting is provided by solar lamps, wind-up lanterns, low energy led battery units and candles. We encourage you to heat the water for our unique eco bucket showers in our custom built wood-fired stoves or directly from the latent heat from your campfire. Recently we have had to include gas water heaters at both forest campsites to comply with the (sometimes ridiculous) campsite licence rules. We are family friendly, and encourage a chilled, relaxed campsite. We operate a low noise policy after 10pm at night to respect fellow campers. No electronic music is permitted (singing and acoustic music is fine until 10pm!). Sorry no dogs or other pets are allowed in the forest campsite to preserve the native flora and fauna. Each bell tent has it own an open fire pit for cooking and relaxing around. They also have their own award winning wood-fired eco camp stove (originally developed for the third world) or rocket stove. Great to boil the kettle when you need a well earned cuppa – although the shed does also have a dual gas stove for those who like short cuts. We have flushing toilets at Wild Boar Wood campsite. The showers are our unique hot water bucket versions – where the water is heated by our wood-burning stove or our little hot water system. All vehicles are parked away from the site, with wheelbarrows provided to carry provisions and bedding across the field into the woodland. We ask the campers to minimise rubbish and packaging they bring to the campsite. Leaving no trace is very important to us and we ask you to help with this as we are off-grid. We do have recycling bins at the campsite and general rubbish collection. If you agree with our philosophy then please join us for some forest camping in Sussex. We support the Woodland Trust – the UK’s largest woodland conservation charity and the leading voice for woods and trees. We support the RSBP – the country’s largest nature conservation charity, inspiring everyone to give nature a home.